Best Buy Europe, a joint venture between US group Best Buy and the UK’s Carphone Warehouse, will be closing all 11 Best Buy stores in the UK. The duo originally planned to open 100 Best Buy stores across the UK and Europe when the first store opened less than two years ago. Best Buy purchased a 50 percent share of Carphone Warehouse’s retail operations for $2.1 billion in 2008. The plan was to use the joint venture to gain ground in the European market and improve brand recognition. The 11 stores are located in Liverpool, Bristol, Derby, Rotherham, Nottingham, Dudley, Southampton, Thurrock, Croydon, Enfield and Hayes. The outlets are being shut down because they haven’t been profitable yet. This is largely to blame on weak consumer spending, low brand recognition and increased competition from other electronics retailers in the area. Best Buy Europe will now focus on selling goods from over 800 existing Carphone Warehouse stores in the UK and more than 1,600 Phone House outlets in continental Europe. In related news, Best Buy has also announced that they will be buying out Carphone Warehouse’s share of Best Buy Mobile in the United States and Canada. 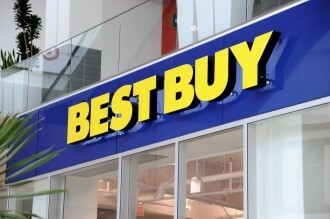 Best Buy Mobile has seen increased profits thanks to soaring demand for smartphones in recent years. The deal between the two is worth 1.3 billion which is more than Carphone Warehouse was valued at when it split from TalkTalk last year. "For Best Buy to be able to no longer have to share 50 percent of the profits of a high-margin, fast-growing business with Carphone Warehouse, from my perspective, is a real positive," said BB&T Capital Markets analyst Anthony Chukumba.